As the lands starts to rise, inland northwest of Valencia, you will find Roselia Molina heading up Bodegas Altolandon. The property consists of 120 hectares with the winery resting right in the centre, not only making it aesthetically satisfying but also extremely practical. At 1,100 metres above sea level, the altitude serves to benefit the grapes with large diurnal variations which encourage even ripening and also helping retain their natural acidity. Organic methods are used to manage the vines utilising only natural fertilisers and some green pruning to further guarantee the quality of fruit prior to hand-harvesting. The grapes are vinified as naturally as possible with native yeasts and little other intervention. The wines are then aged in French oak and some in clay amphora to retain purity, but build complexity. The vineyards face north-south, at about 11 metres surrounded by mountains but on a flat plain. The vineyards are farmed organically, sustainably and biodynamically with vines cordon trained and spur pruned. Harvested late, by hand and never before the 12th October into 12kg cases. The colour is extracted in 6000 litre inox tank. Skin contact for 2 to 3 weeks at a controlled temperature before an alcoholic fermentation which is spontaneous, with gentle pumping over for 5 weeks. Pressed directly to 3rd use, 225 Litre French oak barrels, where the malolactic fermentation takes place, also in a natural and spontaneous way for about 4 months. Stabilisation is also natural and during the coldest months, temperatures can go to minus 15º C.
A deep cherry colour with violet tints. Nose is intense with aromas of ripe red seasonal fruit (cherries, blackberries, blackcurrant), subtle hints of violets, rosemary and a touch of black pepper. 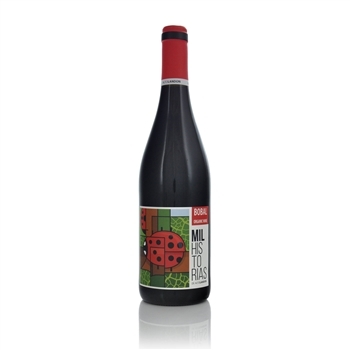 This Bobal shows distinctive power, vibrant fruit, freshness with soft and ripe tannin. It is spicy and juicy with a well rounded palate with a fascinating crunchy-fruit freshness. The finish is gently tannic combined excellent depth. Best with richly flavoured meat. Roasts, cheeses and cold cuts.